Stunning interior plantation shutters add effortless, timeless elegance to any room. Just Shutters can take any window or door and create a feature of beauty. For the largest range of interior window shutters Epsom and Ewell please call us on 01932 500 270. 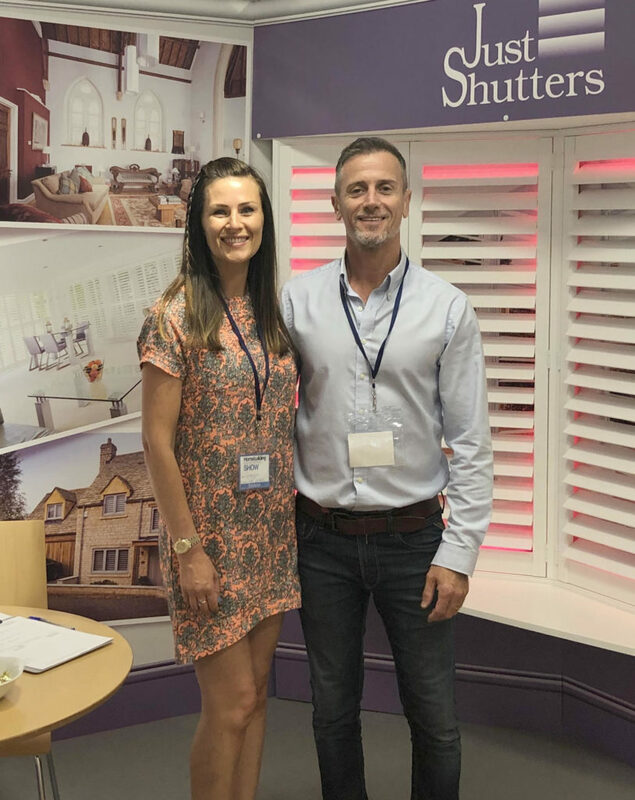 As the experts in plantation shutters, husband and wife team Simon and Georgina Broadhurst (pictured right) provide the widest range of styles, materials and finishes to ensure that your shutters are as unique as you are. And what’s more, complement your home and tastes perfectly. Whatever your style and taste, whether modern and bright or cosy and traditional, even vibrant and colourful, we can create the perfect shutters for you. With over 8000 happy customers we have the expertise and skills to make your room beautiful. Other window solutions such as curtains and blinds can go out of fashion, they can warp, fade and wear, while beautiful plantation shutters have been gracing homes for centuries and offer a timeless elegance and style, they do not fade or warp or bleach in the sun – and with the Just Shutters lifetime guarantee, their value lasts and lasts. Plantation shutters are not only beautiful, they have many practical benefits besides. Their light and shade control is second to none; shutters can open fully and fold back almost completely, providing unencumbered views and easy access to your windows and doors behind, but most of the time shutter panels will stay closed and the louvers will be used to allow in light, allow you to see out, while offering a private sanctuary inside – without the need for old fashioned net curtains! As well as the perfect addition to any living space, shutters are excellent in warm or humid environments such as kitchens or bathrooms, with no risk of mildewing or moulding like fabrics. Children’s bedrooms can also benefit hugely from shutters as they have no dangerous pull cords so are safe for youngsters and people prone to trips or falls. 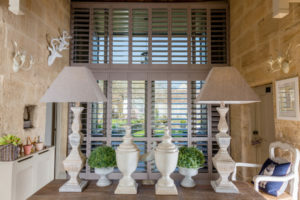 Often viewed as a luxury purchase, shutters enhance the rooms of some of the finest homes and boutique hotels, as well as grace the pages of home and lifestyle magazines, however shutters cost around the same as high-end curtains or blinds, come fully designed and fitted by experts and have many more value added benefits. We offer a lifetime guarantee on all of our window shutters Epsom and Ewell, giving you the peace of mind you need for years to come. Furthermore we stock the UK’s largest range of plantation shutters, including our own exclusive ranges you won’t find anywhere else! Click here to browse our extensive range, and click here to view our stunning shutter galleries. Just Shutters are the shutter experts in Epsom, Ewell and the surrounding areas. We specialise in bespoke interior shutters – nothing else! Shutters are not a sideline, nor an addition, to us they are a passion. We would be delighted to show you why we are not ‘Just’ a shutters company, but rather THE shutter experts. Call us on 01932 500 270 or follow the links below for further information. Just shutters is locally renowned for being the go to company for window shutters Epsom and Ewell. We are immensely proud of the reputation we have built in the area and across the UK! Visit our checkatrade profile to see over 1700 positive reviews giving us an incredible 9.9/10 rating.